Courtesy photo A fundraiser is planned Nov. 12 for Maci Risner, at Contemporary Art Studio at the Richland Mall. NORTH ROBINSON — Colonel Crawford Local Schools invites the public to a Fundraiser for Maci Risner on Sunday Nov. 12 from 2-4:30 p.m. at Contemporary Artspace in the Richland Mall. Maci is a sophomore at Colonel Crawford who was involved in a serious car crash on Sept. 30. A lengthy stay in the hospital and a long recovery is ahead for Maci. She is a member of the Eagles’ golf team and involved in FFA. Students and adults are invited to participate in a open paint class that will be instructed by Contemporary Artspace. During the two-hour session, everyone will complete an acrylic painting on canvas. It costs $30, and includes the canvas to take home or a gift to Maci, and the use of colored pencils, paint, paint markers, brushes, palette and an apron. An art teacher will be in attendance if instruction is needed. Examples of painting will be available or you may bring ideas of what to paint for Maci. Online registration is available for this event or pay cash to Vicki Songer Spangler or Jessica Bruner Flick in advance. to pay online, visit https://www.caartspace.com/product-page/fundraiser-for-maci-risner-nov-12th. All proceeds will go to Maci’s family. 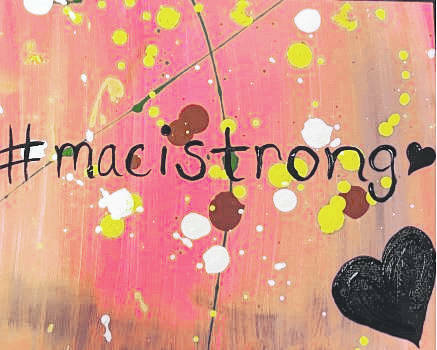 https://www.galioninquirer.com/wp-content/uploads/sites/38/2017/10/web1_Maci-Strong.jpgCourtesy photo A fundraiser is planned Nov. 12 for Maci Risner, at Contemporary Art Studio at the Richland Mall.